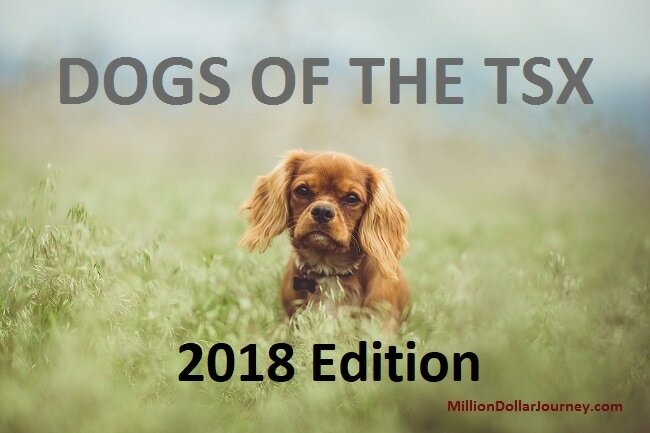 Over the past few years, I’ve been writing about the Dogs of the TSX also known as the Beating the TSX stock strategy (BTTSX). In this strategy, the largest publicly traded companies in Canada (TSX 60) are sorted by dividend yield, then the top 10 positions are purchased annually (remove former income trusts and stocks that have a history of dividend cuts). I’m a bit late writing a Dogs of the TSX article this year and was recently requested/reminded by a reader for an update. According to the Beating the TSX Wiki page, between 1987 and 2011, the BTTSX had an average return of 11.97% vs the TSX which has returned about 9.34%. According to Canadian Money Saver magazine, over the last 17 years, BTTSX has a compound annual growth rate (CAGR) of 11.1% compared to the index CAGR of 7.4%. As you know, small improvements in portfolio performance can lead to a significant difference in portfolio size over the long term. Note my article on improving your portfolio performance by 1.7% through reducing your portfolio MER can lead to a 60% difference in portfolio size over 30 years. It also helps to use a low-cost discount broker. I like this strategy in that investors are getting the highest possible yield out of the largest blue chip stocks in Canada with the possibility of dividend increases (several increases already in 2018). The downsides are that there is annual turn over (usually minimal) which can result in a tax hit in non-registered accounts and potential lack of diversification depending on the year. The group is not bad in terms of diversification but could be better. We have 3 telcos, 3 financials, 2 pure utility, and 2 pipeline utilities. Ideally, we would also have a materials/resources, real estate, technology, and consumer stocks. More on how to build a proper dividend growth portfolio here. You will also notice that the picks are eerily close to the 2017 picks, so turnover this year was minimal. Since Google Finance shut down, I’ve been using Morningstar for my “dashboard” on portfolio performance. 2018 has been a very tough year for dividend stocks in general due to rising interest rates and may continue to be tough for the next little while. As investing is a long-term game, and corrections like this are to be expected. In fact, for people that are still in the accumulation phase (not retired), corrections should be celebrated. Its times like these that dividend stocks are considered “on sale”. I can’t recall a time where I’ve deployed more capital into the market. A number of analysts have the opinion that the “big crash” is coming, and while that could be true – that shouldn’t stop the long-term dividend investor. Best bet is to continue collecting and investing your dividends while waiting for the next sale. I own a number of these picks as part of my forever dividend portfolio. Having said that, the BTTSX portfolio has been hammered this year! Without any pure energy/commodity exposure, the BTTSX portfolio has lagged the TSX by a very large margin. The overall BTTSX performance so far is -6.81% including dividends. What about the Canadian index? Year to date, XIC.TO has returned about 1.10% including dividends. So far in the year, BTTSX is underperforming the Canadian index by almost 8 points, which is pretty significant. However, it’s only halfway through the year, but this could be one of those years where BTTSX underperforms, we just need to wait and see! The expectation of higher interest rate is the main reason for the BTTSX under-performance. I think interest rate won’t go high as people expecting due to so many uncertainties surrounding the Canadian economy. Another reason is energy and material sectors are recovering (major components of TSX). I am a dividend investor as well. My portfolio is also down year-to-date, but I am expecting that dividend stocks will come back to normal mode by end of the year. Hi S Arun, yes I agree on all of your points. The low performance also shows the value of diversification! I’m ok with down years as long as my dividends keep coming in! Great article! Thanks for sharing how you chose dividend stocks. You mentioned that each year you invest in the top 10 holdings. Do you have a rule or guideline for selling any of the stocks? The rule for selling BTTSX stocks is in the new year when you generate your new list of high dividend payers which will indicate which stocks to keep and which to sell. Did you analyze how the strategy worked at the end of 2017? As you can see from Table 1, the return for the BTSX portfolio was 10.5%. This was 1.2% more than the iShares S&P/TSX index ETF (XIU) of 9.3%. I have also included the S&P/TSX 60 Total Return Index Value (TRIV) for comparison. I have BCE, POW (not PWF), NA, and FTS. I have to say that I really don’t understand the need to diversify across all sectors. (Was this created by mutual fund companies?) There are many sectors I know next to nothing about and from what I can see don’t have any companies I would want to invest in. For decades 90% of my portfolio has been a couple of banks, 2 electrical utilities and a pipeline. Looking at my portfolio most would say I am not diversified and my portfolio is high risk. Over the years I have recouped my entire investment in dividends. I now live off the dividends (that continue to grow) and pay 0 tax on them. Don’t think I will change my ways. Thanks for commenting Michael. I would say stick with what works for you, and congrats on retiring on dividends! Can you tell us more? Did you retire early? Hello! I just wanted to let you and your readers know that as the new author of the “Beating the TSX” articles for the Canadian Moneysaver, I wanted to make the method and portfolio available online rather than just once a year in the magazine. The website is http://www.dividendstrategy.ca. Small, simple and, I hope, helpful. BTW, I’m just a DIY investor like most of your readers, who used this method to achieve FI at 42. The information is completely free.